For the past year and a half Steph and I have been going to Grace Community Church, an incredible church which we enjoy very much. Pastor Scott is amazing, the music is great, and we’ve made a lot of great friends (who are actually our age, married, and don’t have five kids… not that there’s anything wrong with kids). So we figured, this is the place, so we’re going to become members. Well, Grace Community is affiliated with the Southern Baptist Convention, and the Baptists love their dunk tank. That’s all fine and well, but for a guy who grew up Methodist (and was baptized as a baby 26 years ago) that’s always been a bit of a hurdle for me to get over. I mean, what, was my orginal baptism not good enough? What’s the difference if I get baptized as a baby, or if it’s actually by immersion? Well, this Methodist was finally broken. Baptism was originally intended to be a public symbolic act of believing in Christ, once they became a believer. And the death and resurrection of Christ is symbolized through the going-down and coming-up from the water through baptism. So today I got baptized and became a member of Grace Community Church! A cool experience and worth the 26 year wait. As I was telling someone earlier, the Methodists got me on the Heaven waiting list with infant baptism… glad I’ve got my reserved seat now though. Thanks Stephanie, Brian and Krista, and Rachel Ray for coming!! Here’s a post-dunk picture for ya, note semi-wet hair. Finally, a cool enough weekend where we can actually turn off the freakin’ air conditioner and open the windows. This summer has been long enough. The hottest on record they say, and I for one want to be done with it. So, to celebrate, I’m going outside to play. I just totally got schooled by Josh in ping-pong… Arghudljasdhd!!! That was tremendously disapointing. Ah, but now I have a new mission in life!! I’m coming for you Josh…. Ping-Pong. Wow, what a marvelous game! My company made the poor and unwise decision to invest in a ping-pong table for our third floor “commons” area. It is certainly where I have been spending all of my free time lately. Now, I grew up with a ping-pong table at my house… and I played a fair bit, but generally against my grandparents, so no true advancement in skill was made in my early years. Over the years I’ve played from time to time, and I’ve gotten quite a bit better. Now, I am certainly nowhere near the skill level of ping-pong extraordinaire Timmy P (and he truly is quite good). Timmy was in Ping-Pong Scouts – had a uniform that he would wear to school all the time. He had these cute little patches that he would sew to the back of his shirt every time he won a tournament. Then in our junior year he decided he wanted to do both Bowling Club and Ping-Pong Scouts, so his ping-pong game started to suffer a bit….. but I digress…. 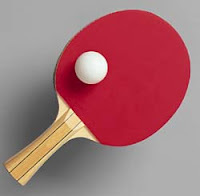 I want to get an EMI Ping-Pong Tournament going… that’s my goal for the fall.